Terrapin | Beer Apprentice - Craft Beer News, Reviews, Interviews and Info. Hello everyone. I hope all is well. Thanks for checking back in on another craft beer review. Today, I’m going to be drinking the Nogne O/Terrapin Imperial Rye Porter produced in a collaboration effort by Nogne O – Det Kompromisslose Bryggeri A/S located in Grimstad, Norway and the Terrapin Beer Company situated in Athens, Georgia. I have thoroughly enjoyed all of the Nogne beers I’ve gotten my hands on, however Terrapin is not distributed in my area. I’ve heard a great deal of positive things about them though, so let’s hope this brew is a good one. Neither brewers website, nogne-o.com nor terrapinbeer.com, had a description of this particular beer, but I was able to find a bit of information from ratebeer.com. Ok. Not much to go on there, so let’s just pour it and see what we have. It poured pitch black with a tan colored head. The crown was very smooth creamy, soft and frothy with a lot of tightly compacted bubbles. It was greatly sized with a tremendous retention time. The lacing was very thick and clingy as well. Simply a beautiful looking beer. 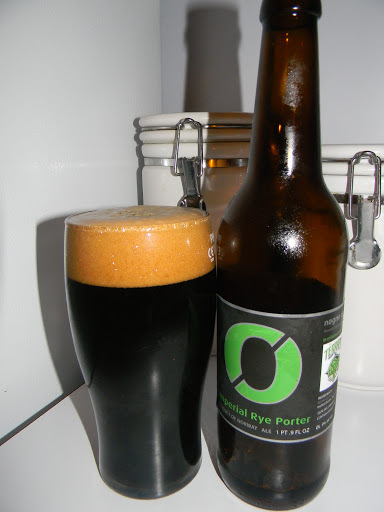 One of, if not the best looking Porters that I have ever laid my eyes on. That’s one thing I will say about the Nogne beers that I’ve tried. They all look phenomenal in the glass. The nose brought forth a solid dose of roasted malts. Toasted grains and breads intermingled with hints of coffee and dark chocolate. The spicy rye was light, however it did seem to release a touch of nuttiness with deeper whiffs. As it warmed it began to uncover a subtle sweetness that one may find in an Oatmeal Stout. Kind of milky too. As a matter of fact it started to get real milky and creamy as it opened up. A very, very nice and inviting aroma to say the least. The taste also presented a creamy/milky sweetness. Relishes of coffee and bittersweet dark chocolate added a good source of complexity. Roasty, toasty malts and grains (as to be expected) really hit the spot. Like the aroma, the rye remained somewhat subdued, although it was easily detected with long sips. A very, very good taste in my opinion. The mouthfeel was full bodied. Thick, chewy, dry, smooth and creamy with just a touch of chalkiness on the swallow. The carbonation was on the lower side and a slight bit of warmth was felt from the alcohol. A plethora of flavors were left behind on the palate long after each sip. Man. I thought this was a great beer. I altogether enjoyed it very much. This brew would be great for a cool evening that’s for sure. The drinkability wasn’t bad either. I had no problem whatsoever in finishing this bottle. It was a bit thick, but that didn’t deter me. I kept chugging. It’s definitely worth a try if you guys haven’t done so already. I think I’ll probably pick up another bottle or two myself before too long. So, with that being said, pick up a bottle of the Nogne-O/Terrapin Imperial Rye Porter and see what you think. If you like Porters I doubt that you will be disappointed. Thanks for reading everyone. Don’t be afraid to comment if you would like.